Aim: The aim is to determine the gonioscopic features of pseudoexfoliation (PXF) and to study its relation with glaucoma as measured by intraocular pressure (IOP) and optic nerve head changes. Materials and Methods: A cross-sectional study was conducted among forty eyes with PXF at a tertiary care center in South India from March 2016 to March 2017. Corrected IOP based on central corneal thickness was recorded and gonioscopic examination was done to grade angle, detect PXF deposits in angle and grade trabecular meshwork and sampaolesi line (SL). Eyes were dilated for glaucomatous optic disc change and optical coherence tomography was done to record retinal nerve fiber layer thickness. Data were entered in Microsoft Excel and frequency of different variables was calculated. Statistical analysis was done using Chi-square test and t-test as applicable. Results: Thirteen eyes had Grade 4 pigmentation, of which seven eyes had high IOP and ten had disc damage. Seven eyes had PXF in angle with glaucomatous change in four eyes. Two eyes had occludable angle with both eyes having glaucomatous change. SL was seen in 15 eyes. Conclusion: Pigmentation of trabecular meshwork, pseudoexfoliation deposits in angle and occludable angle in gonioscopy have positive correlation with high IOP and degree of glaucomatous disc damage. This study proves the significance of gonioscopy in PXF. Few studies have been conducted explaining and contradicting many pathogenic mechanisms of pseudoexfoliation glaucoma (PXG) such as iris pigment-blocking trabecular meshwork (TM), exfoliated material itself blocking TM, and molecular changes in TM cells. However, the exact mechanism is still in doubt. Although PXG is the most common cause of secondary open-angle glaucoma, closed angles have also been explained as a cause for glaucoma. Not many studies have been conducted to prove the authenticity of the above statements and to study whether any relation exists between anterior-chamber angle and severity of glaucoma. The aim of our study is to determine the gonioscopic features of pseudoexfoliation (PXF) and to study its relation with glaucoma as measured by intraocular pressure (IOP) and optic nerve head (ONH) changes. This is a cross-sectional study conducted among forty eyes with PXF in the outpatient department of a tertiary care center in South India from March 2016 to March 2017. The study was approved by the ethical and review committee of the institution. Patients with PXF in one or both eyes who are not on any antiglaucoma medications were included in the study. Pseudophakic and aphakic eyes and those with a history of uveitis, ocular trauma, and preexisting optic neuropathy were excluded from the study. In eyes with cataract precluding fundus view and optical coherence tomography (OCT), gonioscopic features were studied prior and fundus and OCT examinations were done within 2 weeks of cataract surgery. Informed written consent was obtained from all patients. After noting a short history, three IOP recordings were taken at different times from 8 am to 1 pm using applanation tonometer. Central corneal thickness was measured using SP-3000P Topcon specular microscope with pachymeter, and the corrected IOP was recorded. The highest recording was selected for each patient and grouped as <10 mmHg, 11–14 mmHg, 15–20 mmHg, and >21 mmHg. More than 21 mmHg was taken as significant high IOP. Grade 4: Wide open, all structures up to ciliary body identified. Grade 4: severe – brownish black, darker than adjacent iris. The highest grade of pigmentation in two or more angles is taken as the grade (Gr) of TM in that eye. The presence of Sampaolesi line (SL) (line of pigment deposits) anterior to TM in each quadrant was noted. Eyes were dilated with a combination of 0.8% tropicamide and 5% phenylephrine eyedrops. Fundus examination was done by slit-lamp biomicroscopy with 90 D lens to look for any glaucomatous changes such as high cup-to-disc ratio (CDR), presence of bayonetting of vessels, baring of circumlinear vessels, disc hemorrhage, and retinal nerve fiber layer (RNFL) defect. OCT RNFL with 3D Topcon OCT Mastero (Topcon Europe Medical BV, Capelle aan den I Jessel, Netherlands) was done and the presence or absence of thinning in each quadrant was noted. RNFL thinning was defined as RNFL thickness below the 5th percentile in RNFL thickness map of fast RNFL scan. RNFL thickness was grouped as no thinning, thinning in one quadrant, and thinning in two or more quadrants. Data were entered in Microsoft Excel and frequency and percentage of different variables were calculated. Statistical analysis was done using Chi-square test for qualitative variables and t-test for quantitative variables using IBM SPSS Software version 24.0 (Armonk, Newyork, USA). P < 0.05 was considered statistically significant. Sensitivity, specificity, and diagnostic accuracy of Grade 4 pigmentation, presence of PXF in angle, and SL in diagnosing high IOP (more than 21 mmHg) and RNFL thinning (in at least one quadrant) were calculated. Of the 40 eyes with PXF, 13 (33%) had Grade 4 pigmentation, 25 (62.5%) had Grade 3 pigmentation, 2 (5%) had Grade 2 pigmentation, and none had Grade 1 pigmentation. Nearly 53.8% of the eyes with Grade 4 pigmentation had IOP more than 21 mmHg (P = 0.01). Severity of glaucomatous optic disc damage increases with the grade of pigmentation [Table 2] (P = 0.034). Severity of optic disc damage as measured by RNFL thinning in OCT increases with the grade of pigmentation [Table 3] (P = 0.01). PXF in the angle was visible in seven eyes (17.5%), of which one eye had deposits in both inferior and nasal angles and others only in inferior angle. IOP was found significantly high in the eyes with the presence of PXF in angle [Table 4] (P = 0.04). Severe glaucomatous disc damage was observed in the eyes with exfoliative material in the angle [Table 5] (P = 0.001). Severe RNFL thinning was seen in the eyes with exfoliative material in the angle [Table 6] (P = 0.025). Two eyes with PXF had occludable angle, and others were open. Both eyes with occludable angles had IOP >21 mmHg, CDR >0.8, and RNFL thinning in more than two quadrants in OCT.
SL was seen in 15 eyes (38%) in one quadrant (all in inferior quadrant) and in one eye each in two and four quadrants (2.5%). Twenty-three eyes (58%) had no SL. The two eyes with SL in more than one quadrant had normal IOP and optic disc [Table 7], [Table 8], [Table 9]. Of the forty eyes with PXF examined in this study, all eyes had greater than Grade 2 pigmentation with majority, i.e., 25 (62.5%) had Grade 3 and 13 (33%) had Grade 4 pigmentation. In eyes with asymmetry in pigmentation in each angle, the highest grade of pigmentation was seen in inferior angle, but the other angles showed no specific pattern. Thirty eyes (75%) had Grade 4 pigmentation in inferior angle. Sirel et al. 's study showed that in eyes with unilateral PXF, pigments in inferior angle in the fellow eye were the most common earliest finding associated with PXF. Pigment deposition starting in inferior angle could be responsible for the high grade of pigmentation in inferior angle. Cobb et al. 's study showed that no association existed between angle characteristics and severity of glaucoma in eyes with PXF. Shuba et al. 's study showed a positive correlation between pigmentation of angle and IOP but no correlation with the severity of glaucoma. According to Puska et al. 's study, pigmentation was stronger in the eyes with PXG than eyes with PXF alone and showed a positive correlation between degree of pigmentation of angle and IOP. Our study in accordance with Puska et al. 's study also showed a significant positive correlation between degree of pigmentation of angle and IOP (P = 0.01) [Table 1]. Of the 13 eyes with Grade 4 pigmentation, seven eyes (53.8%) had high IOP, where only 8% of eyes with Grade 3 and none with Grade 2 pigmentation had high IOP. Disc damage on fundus examination was also high in eyes with Grade 4 pigmentation. Ten eyes (76.8%) had glaucomatous disc damage, with 23% having CDR >0.8 (P = 0.034). OCT RNFL also confirmed the same. RNFL thinning was seen in nine eyes (69.18%) with Grade 4 pigmentation as compared to only 36% eyes with Grade 3 pigmentation (P = 0.01). Grade 4 pigmentation was found to have 92.5% specificity and 80% diagnostic accuracy in detecting high IOP and 67.5% diagnostic accuracy in detecting disc damage. The presence of PXF in angle was visible in seven eyes (17.5%). All except one eye had PXF in inferior angle alone. When Puska et al. 's study showed a positive correlation between IOP and the amount of exfoliative material (with a statistically low significance), Moreno-Montanes et al. and Shuba et al. observed no correlation between IOP and the amount of exfoliative material.,, However, in these studies, exfoliative material on the anterior lens capsule was studied and not in the angle. Various studies have shown that clearing the angle off exfoliative material during surgery can itself decrease IOP in PXG. Our study showed a positive correlation between the amount of exfoliative material in angle and IOP. Four out of seven eyes (57.1%) with PXF in angle had high IOP. However, PXF alone cannot be taken as a determinant factor of high IOP as 12.12% eyes without exfoliation in angle had high IOP (P = 0.04). Glaucomatous disc damage was seen in all eyes with exfoliation in angle, with three eyes (42.85%) having CDR >0.8 (P = 0.001) and RNFL thinning in more than two quadrant (P = 0.025). 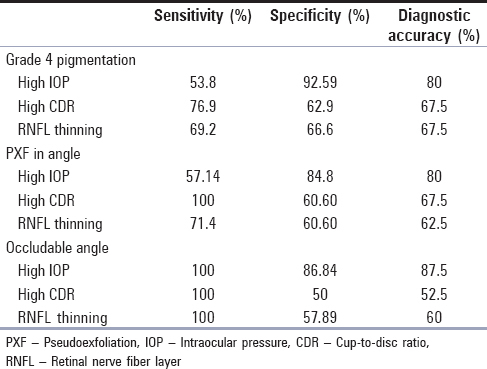 The presence of PXF in angle was also found to have high sensitivity, specificity, and diagnostic accuracy in detecting high IOP and disc damage [Table 10]. In Wishart et al. 's study, a high frequency of narrowness of anterior-chamber angle was found (32%); 18% had occludable angles and 14% had obvious angle-closure glaucoma. A number of mechanisms may create a tendency toward pupillary block, and angle closure, including zonular weakness, causing anterior movement of lens, lens thickening from cataract formation, and increased adhesiveness of iris to the lens (occasionally with posterior synechiae) due to exfoliative material. In our study, two eyes (5%) with PXF had occludable angles, and others were open. Both these eyes had IOP >21 mmHg, CDR >0.8, and RNFL thinning in more than two quadrants in OCT. Anteriorly subluxated brown cataractous lens was noted in both these eyes which could be the contributing mechanism of occludable angle. Two mechanisms acting together – angle closure and exfoliative mechanism – can explain the grave glaucomatous damage in these eyes. SL in the angle was the most common gonioscopic feature in our study followed by Grade 4 pigmentation of TM. SL was noted in 17 eyes (42%), of which 15 eyes had SL in inferior quadrant alone, one eye had it in two quadrants, and one eye had it in all the fourquadrants. According to Cobb et al. 's study, SL is associated with PXF syndrome but lacks correlation with glaucoma. In our study, though no statistically significant relation could be made, five out of 17 eyes with SL (29.4%) had high IOP [Table 7]. However, two eyes with SL in more than one quadrant had normal IOP and optic disc. Eleven eyes (64.7%) had CDR >0.5, with two eyes having it >0.8 [Table 8]. RNFL thinning in OCT was also seen in eight eyes (P = 0.431) [Table 9]. As no significant relation could be attained between SL and glaucoma features, sensitivity, specificity, and diagnostic accuracy were not calculated. Gonioscopic features such as pigmentation of TM and presence of PXF in angle have a positive correlation with IOP and degree of glaucomatous optic disc damage. Occludable angle if present has an additive effect on the degree of glaucoma damage. SL has no significant relation with glaucoma. Thereby, this study proves the significance of gonioscopy in any case of PXF. Gür Güngör S, Bayer A, Akman A, Asena L. Early clinical features of pseudoexfoliation syndrome in anterior segment and gonioscopy examination. Turk J Ophthalmol 2017;47:5-8. Cobb CJ, Blanco GC, Spaeth GL. Exfoliation syndrome angle characteristics: A lack of correlation with amount of disc damage. Br J Ophthalmol 2004;88:1002-3. Shuba L, Nicolela MT, Rafuse PE. Correlation of capsular pseudoexfoliation material and iridocorneal angle pigment with the severity of pseudoexfoliation glaucoma. J Glaucoma 2007;16:94-7. Puska P, Harju M. Optic nerve head topography in nonglaucomatous, normotensive patients with unilateral exfoliation syndrome. Graefes Arch Clin Exp Ophthalmol 2009;247:1111-7. Moreno-Montañés J, Quinteiro Alonso A, Alvarez Serna A, Alcolea Paredes A. Exfoliation syndrome: Clinical study of the irido-corneal angle. J Fr Ophtalmol 1990;13:183-8.